Repair dripping faucets by replacing washers. If your faucet is dripping at a rate of one drop per second, you can expect to waste 2,700 gallons per year. This adds to the cost of water and sewer utilities, or can strain your septic system. If the toilet handles frequently sticks in the flush position letting water run constantly, replace or adjust it. Store drinking water in the refrigerator. Don't let the tap run while you are waiting for cool water to flow. Kitchen sink disposals require lots of water to operate properly. Start a compost pile as an alternate method of disposing of food waste instead of using a garbage disposal. Garbage disposals also can add 50 percent to the volume of solids in a septic tank, which can lead to malfunctions and maintenance problems. Consider installing an instant water heater on your kitchen sink so you don't have to let the water run while it heats up. This will reduce water heating costs for your household. Never install a water-to-air heat pump or air-conditioning system. Newer air-to-air models are just as efficient and do not waste water. Electric lighting adds heat to a space that must be removed in the summer by air conditioning. Turn lights off when not in use. Close the fireplace damper tight when the heating season is over. Wash full loads when using the washing machine or clothes dryer. A 40 watt incandescent lamp and a 40 fluorescent bulb use the same amount of electricity, but the fluorescent lamp creates five times as much light. Use the economizer cycle on the dishwasher and let the dishes drip dry instead of using electric heat to dry them. Don't block the supply air or return air ducts to the air conditioning system with furniture or drapes. Keep doors open in all rooms cooled by a central air conditioning system so that supply air can return easily to the unit. Be sure the air conditioning system is fully charged with freon so it will operate most efficiently when you need it. Check your auto and home air conditioning systems for freon leaks and repair them properly. Freon damages the ozone layer. When the weather is nice outside leave the AC off and open the windows. Duct air to ice machine condenser instead of using conditioned air that is exhausted to the outside. That way the heat generated by the condenser never enters the air conditioned space. Shop around for energy efficient computers, monitors and accessories. Use the kitchen exhaust fan when cooking to vent humid and odorous air. Be sure to open the windows now and again to air out the house or business. Fresh air is vital to human activity. Collect rain water in a cistern for watering plants, garden and landscaping. Plants help to purify air in the home. They extract carbon dioxide and create oxygen. Inadequate ventilation in an office or home can result in the "sick building" syndrome and possible illness to people within. Problems can range from dizziness or headaches to allergies or worse. Turn all the lights and equipment off in the office when you go home for the night. Use electric instead of gas powered lawn and garden equipment, as they create less pollution and are usually more efficient. Solar screens on south and west facing windows will reduce the cooling load of a building in the heat of the summer. Plant shrubs and trees around the air conditioning condenser to improve its operating efficiency. The shade makes it work less to cool the refrigerant circulating from the inside air handler. Clean out bird nests and debris from attic louvers so that air can flow freely through the attic space. Your home will be cooler. Teach your employees the intrinsic value of energy and the importance of conserving non-renewable resources such as coal or oil. Plant grass or ground cover on exposed land to prevent loss of topsoil from erosion. Landscaping also reduces the amount of reflected heat reaching the building shell. Organize a recycling program at your office or school and show everyone the savings possible. Teach your employees respect for nature, it will be a lifelong joy and benefit to them. Ride a bicycle or walk to work when the weather is temperate. Turn the water heater setting down a few degrees and reduce the amount of electricity you use. A typical home uses 30% or more of the electric bill on hot water. Install an insulating blanket on the water heater so that it will operate more efficiently and cost you less each month. Using less hot water around the house saves energy too. Launder clothes in cold or warm water, take a shower instead of a bath or install a flow restrictor on the kitchen or utility room sink. Install a timer on the hot water heater and turn it on only for a couple of hours each day when all the domestic chores are done. Drying clothes on a line instead of in a dryer uses less energy and is easier on the fabric too. The coils at the back of the refrigerator are heat exchange surfaces. Keep them clean and the unit will operate at peak efficiency. Standing with the refrigerator door open lets humid air in. This makes it harder to cool and it will condense in the freezer into ice. Manual defrost refrigerators use less energy than automatic defrost models. Extinguish the gas furnace pilot light at the end of the heating season so you do not continue to burn gas unnecessarily. Clean air conditioning ducts in older homes and businesses to increase the efficiency of the air conditioning system and save on the bills. A high efficiency air filter used on the air conditioning can help against airborne particles that cause allergies. Exhaust all the hot humid air from the restroom after bathing, as the humid air puts a heavy burden on the air conditioning system. Put a brick or bottle full of water in the commode reservoir to reduce water use. Plant natural grasses and shrubs that are native to your area and that do not require a lot of extra water in the summer. Defrost the freezer regularly to keep ice from building up on the coils and making the unit operate less efficiently. Wear lighter clothing in warm weather and raise the AC thermostat. Modify the office dress code so people can dress more casually and be comfortable with the thermostat set a few degrees higher. Heat your pool the smart way - purchase a solar blanket and let the sun do it. Put lower wattage bulbs in fixtures that are used for area lighting or exterior lighting. Use an inexpensive photoelectric light for nighttime lighting in the yard or home so the lights burn only when it is dark outside. Motion sensors will turn on outside security lighting only when movement is detected within its range and keep from running the lights all the time. Solar film installed on the south and west windows will keep the house cooler in the summer. Replace inefficient incandescent outside flood lights with more efficient high pressure sodium or low pressure sodium lamps. The latter are better in areas with bug problems. Use ceiling fans in classrooms and offices to circulate the air in the summer and to move warm air down from the ceiling in the winter. Clean the lens of fluorescent fixtures periodically so the light transmittance losses are minimized. Purchase efficient replacement lamps when the present bulbs burn out. Remove concealment and bushes that are so near AC condensing units that they restrict the flow of air. Repair holes and broken seams in ductwork to be sure all the conditioned air arrives at the occupied spaces and is not lost in the attic or ceiling space. Install extra insulation in the attic to reduce your bills year round. Replace incandescent lamps with compact fluorescent lamps for up to 80% reduction in electricity use. Repair caulking and weather-stripping around doors and windows to weatherize your home to be easier to heat and cool. Open blinds and curtains in the winter to let the sun heat up a space in the winter, then close them at night or when it is cloudy outside. Changing air filters for the air conditioning monthly during times of high use will keep the equipment working at peak efficiency. Do not use gas heaters unless adequate fresh air is available, or the unit will use up the oxygen in the space and cause a carbon dioxide buildup. This may cause headaches, dizziness or worse problems. Do not use the kitchen stove to heat rooms. Keep the lawn grass a little longer in real hot weather - it will use less water and be healthier. Turn the screen off on the computer terminal at work when you will not be using it for a while. Leave lawn clippings after mowing to fertilize the grass, or collect the clippings and use them for much. Save old binders and computer paper from the office for schools in the neighborhood. Remove old items from the refrigerator regularly so you don't waste electricity keeping them cold all the time. Re-use waste basket liners around the office. Bring old documents and papers to a printer and recycle them into scratch pads for use around the office. Use the water from cooking vegetables to make soup. Discover the extent of the watershed supplying the aquifer or watertable in your area and practice clean water use within its bounds. Walk the golf course instead of driving a golf cart. Sweep and rake by hand instead of using a power blower. Buy certified organic produce and frequent farmer's markets. Double pane the windows or purchase storm windows. Purchase home and automobile air conditioning equipment that uses freon with a low ozone depletion potential. Install a motion sensor to turn off lights in offices and spaces with erratic occupancies such as restrooms and mechanical rooms. Use a combination photocell-switch to turn off lighting in offices or rooms with daylighting available much of the day. Drive the speed limit and save diesel or gasoline. When purchasing replacement appliances buy the energy efficient types. Turn off lights, radios, televisions and other items when they are not being used. Plant evergreen trees to break the strong winter winds before they reach your home or office building. Install a replacement roof on your home that is light in color if the summers are extreme. Your air conditioning will work less to keep your home cool. Radiant barriers in the attic space prevent much thermal energy from entering the occupied space and burdening the air conditioning. Clean out the drain pan of the air conditioning unit regularly to prevent bacterial growth from spawning there, then entering the air. Common office equipment can be responsible for the release of volatile organic compounds, such as blueprint machines, copiers and white out fluids. If air is moving well, such as from a ceiling fan, it can be a little warmer and still give the sensation of being comfortably cool. Many ceiling fans can be operated in reverse in the winter to push warm air down from the ceiling to the occupied spaces. Store cleaning materials in tightly closed containers so fumes cannot leak into the air. The presence of respirable particles can affect the health and productivity of building occupants. Too much light on the desk surface can be just as harmful to the eyes as too little. Most offices are overlit, especially if the overhead lighting is supplemented by daylighting from windows. A typical air conditioning system should supply 20% fresh air to all the conditioned zones. Clean the air conditioning return and supply diffuser grills regularly to save fan horsepower and keep the air stream cleaner. Air conditioning ductwork can be the source of microbial growth over time, especially in a damp environment. Metal ducts can be cleaned. Smoking areas require a greater ventilation rate than other conditioned spaces, thus are more costly to heat and air condition. Keep circulating air out of a building for a few hours once a week after hours to circulate all the carbon dioxide built up. Turn on the heat or air conditioning an hour or two before leaving and the office will continue to be comfortable until the close of business. Abundant shade, greenery and grass around a home keep the building cooler and easier to cool. Tune up the car engine regularly to maintain the gas mileage at its highest possible level. Tilt blinds slightly to keep direct sunlight from entering a room and heating it up unnecessarily in the summer. Clean the attic louvers of nests, debris or other items that can block the flow of air and cause the attic to heat up. Many heating and air conditioning ducts in the attic or ceiling space of older homes are not insulated. Proper insulation will save a lot of energy and cause the system to operate more efficiently. Homes and businesses can lower the temperature of domestic hot water in the summer months and still provide adequate comfort and service. A programmable thermostat at home can turn the central unit up a few degrees after you go to sleep in the summer and during the day, for 105. A gas powered furnace or hot water heater located in the home must have adequate ventilation so the equipment has enough combustion air to perform at peak efficiency. Insulating hot water lines in the slab or crawl space will save on the water heating bills. Heat tape will further increase savings. Fax machines use only a seventh to half the energy needed to send a document by overnight delivery services. Active noise cancellation technology can reduce the energy consumed by large diesel engines by reducing the energy wasted in the muffler. A good electric heat pump can beat the resources-to-be-delivered efficiency of a gas furnace. Water outdoor shrubs before a hard freeze to protect them. Take shorter showers to save water and install a flow restrictor on the shower head. Shower instead of taking a full bath. An efficient air conditioning system for dry climates is the substantial savings. An evaporative precooler is a good idea for existing units as well and will make the packaged system more efficient. When buying a refrigerator, choose an energy efficient model. Side by side models are less efficient that other units. Automatic defrost refrigerators use more energy than manual defrost models. Use the lowest octane gas your car can tolerate without knocking. Roof and trunk racks on cars or trucks upset the body's aerodynamics and reduce gas mileage. Clean out heavy items such as tools from the trunk of your car. They are extra weight the car must move and so they reduce gas mileage. Irrigating efficiently saves water and for large acreages it saves pump energy as well. Protection of wooden structures exposed to the elements will make them last longer and look more appealing. Quality filter elements can help minimize airborne particles in the home that cause allergies. Electrostatic filters are quite effective. Excessive moisture in the air is bad for buildings during the cooling season. The humid air places an extra heavy burden on the air conditioning apparatus and can cause moldy curtains, walls and other surfaces. Protect structural wood components from decay by moisture, fungi and termites. Check car fan belts regularly and change them when they become cracked, worn or oil soaked. If the freezer is not full already fill plastic jugs with water and keep them in the freezer compartment. 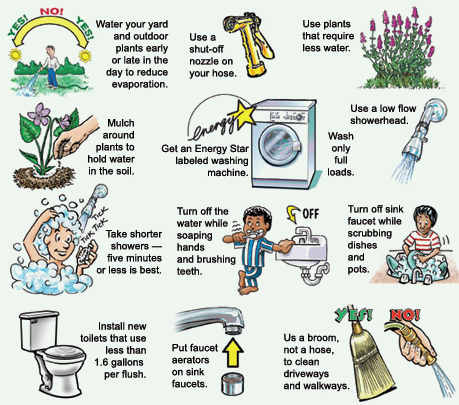 Turn the water heater off when you are gone for a long weekend or on vacation for several days. Install a water saving toilet when it is time to replace or remodel. Many cities offer rebates to encourage water conserving appliances. In offices with overhead lights and task lighting at each workstation reduce the ambient lighting to the minimum. Replace fluorescent lamps with more efficient models when they burn out. Many utilities offer rebates for high efficiency lighting retrofits. Turn HVAC systems off at night so fresh air can infiltrate naturally. Use the extra heat left over after cooking in the oven to do other tasks such as rising bread or warming food. Homes with basements can save on their heating and cooling bills by providing extra insulation in the basement. Run the dishwasher in the evening and open the door overnight so the dishes can drip dry. Plant shade trees in the yard, by roadways and in vacant lots. Comb the fins on the air conditioning condenser outside when they are mashed or disfigured to improve the heat exchange rate of the unit. Use smaller appliances such as pressure cookers, woks or broiler ovens instead of the full oven when cooking small portions. If you leave a room for more than 15 minutes turn off the lights and other appliances such as radios or televisions being used. You can turn off the oven or stove a few minutes before an item is finished cooking and the residual heat will finish the job. Most electrical appliances, such as motors, lights and electronic components generate heat that puts an extra burden on air conditioning. Tenant sub-metering is an effective energy conservation measure for large building owners. Enroll your company in the EPA's Green Lights program and learn how you can save on your utility bill. Purchase an inexpensive light meter and tailor the lighting throughout the office or business to the minimum lighting requirements. Most places are overlit - especially rooms with daylighting - and can benefit from lower wattages lamps. Reduce the exterior nighttime lighting for your business to the minimum for safety and publicity. Have building cleaning and maintenance personnel work during the day rather than at night when the air conditioning and lights must be on specifically for their activities. Home photovoltaics are an option for remote houses or equipment sheds. Organizations that foster telecommuting report substantial productivity gains. Proper light, of an appropriate level to the task performed can boost morale, productivity and general feeling of wellbeing. Don't open the refrigerator or freezer until you are sure what you will be getting. Keep a list of contents posted on the door with an inventory of contents. Close off air vents and keep the doors closed to rooms that are seldom used to save on air conditioning and heating costs. Reduce the risk of ocular problems by designing offices and workstations to provide the optimum light at the work surface. Use drapes and awnings to reduce the heat transferred through windows by closing them when a space is not currently in use. Even partially closed vertical or horizontal blinds help. Multi level light bulbs are energy savers if they are used at the lowest wattage whenever possible. Recycle magazines, notepaper and computer printouts along with the newspaper. Or bring them by your health club or doctor's office. Turn upper floor office lighting and accent lighting at night to reduce light pollution. Gravel, rock and asphalt surfaces prevent rain from soaking through to the water table and aquifer. Plant grass or ground cover where possible to help preserve an ecological balance. Find out if your business is charged a peak demand charge by the electric utility company and investigate ways to reduce that expense. Building operators can save money by operating only one elevator on weekends and at night. Interlocking security lighting with a motion sensor instead of an on-off switch or even a photocell will reduce the cost of operating it and give notice of intruders. Dimmers can reduce the cost of lighting and cause a more healthy and effective lighting level, especially in spaces with several different functions. Multiple switching of fluorescent ceiling fixtures can save energy by turning on only as many lamps in each fixture as is necessary for adequate illumination. Reduce your use of electric appliances such as hole punchers, pencil sharpeners and copy machines. Turn the pilot flame of the furnace off at the end of the heating season so it does not burn all summer long unnecessarily. Plant wildflowers in vacant lots, roadsides and other public areas so that the grass will have to be mowed less frequently. Conserve paper around the office by making fewer copies and by using electronic storage and communication methods. Post general office notices on a bulletin board instead of circulating notices to each individual. Variable speed motors and controls on air handling units can save on cooling and heating costs. Replace fluorescent lamp ballasts with electronic ones and save. Buildings that have a hot water circulating system can save by turning the circulating pump and water heater off at night and on weekends. Donate old appliances, tools and electronics to charitable groups so they can repair them for the less fortunate. Recycle newspapers and save trees. They say that every Sunday edition of the New York Times uses a whole tree. Rehang misaligned windows and replace windows with broken or cracked panes. Reduce the quantities of air exhausted from kitchens, restrooms and laboratory vent hoods as much as practicable. For restrooms that exhaust constantly disable the air supply and let the space be conditioned by return air drawn in by the exhaust fan. Use a high efficiency filter for the air conditioning system to protect the fan, motor and air distribution system from build up of dust and dirt that reduce efficiency. Adjust exterior doors to minimize the crack all around so that air infiltration is minimized. Keep the refrigerator coils free of ice build up by defrosting at regular intervals. Fluorescent lighting is five times more efficient as incandescent. Spores and microbes can collect in carpet, furniture and drapes and impair the quality of the air indoors. Clean these items regularly. Businesses can save by turning the AC off at night or by setting it back a few degrees. Inadequate ventilation in an office or home can result in the "sick building" syndrome and possible illness to people within. Insulate the tubing from the air conditioning condenser outside to the fan and heat exchange coils inside. Thaw frozen foods in the refrigerator to take advantage of their low temperature. Preheat the oven for baked goods only and don't preheat sooner than is necessary. Recycle building materials such as bricks, masonry, timber, steel and ceramic tiles. The aluminum industry consumes 1.4% of all the world's total energy. Recycle aluminum cans and other items. Recycle wood and wood products into chips for firing furnaces or for composite wood products. Landscape shading of walls and roof will conserve on summer utility bills. Purchase efficient heat pumps for your home or business. Solar hot water heaters are a renewable energy resource. Reduce lighting levels for non-critical tasks. Purchase an inexpensive light meter to check light levels against the standards. Install locking thermostats in office areas to prevent tampering with the settings. Concrete accounts for two thirds by weight of North America's demolition waste. Recycled steel comprises 66% of the new steel in the United States. Isolate storage rooms from occupied spaces and do not condition the air to them at all if possible. Turn off portable space heaters and fans when they are not needed and when the room is not occupied. Inspect all automatic doors for proper functioning. It is especially important that they close completely to minimize any air infiltration. Develop an after hours equipment check list by custodial and security personnel to ensure that all unnecessary equipment such as lights, typewriters and computers are not left on. Adjust the temperature control on the refrigerator and freezer to the warmest practical temperature. Locate the refrigerator away from the stove, a heating vent or where the sun will shine directly on it. Be sure there is enough clearance at the back of the refrigerator for air to circulate. The coils are heat exchange devices that transfer heat from the unit to the air by way of a circulating fluid inside. Store only foods that must be refrigerated in the icebox. Keep foods covered tightly to reduce moisture buildup in the icebox. It takes more energy to cool humid air than dry air. Wipe moisture from bottles and cartons before putting them in the refrigerator to be sure they do not add to the latent load. Establish rules and post them asking everyone to keep outside doors closed and to use them only as necessary. Cover the fresh air intake for through-the-wall air conditioning units when they are not used for a season to keep air from entering. Interlock restroom exhaust fans with the lights and control the lights with an occupancy sensor/switch combination so they operate only when the room is in use. Install a thermostat to control the attic fan so that it operates only when the temperature is ten or more degrees above ambient. Purchase vent hoods that introduce a percentage of air as untreated outside air instead of exhausting 100% of conditioned air from the space. Existing vent hoods can sometimes be modified with this option for great savings. Gasket the bottom of all garage type doors if they enclose a conditioned space. Check the refrigerator door gasket and replace it if it is not sealing tight. Use heat tracing to keep hot water piping warm and adequately insulate the lines. Reuse old file folders, dividers and manila folders in the office by using new labels. Reduce the use of internal heat generating office equipment such as lights, computers and copying machines during the summer in exterior zones and all year long in interior zones. Turn all central HVAC equipment off by a fixed time clock schedule. Cooking with lids on pots and pans can reduce by half the heat required. Don't use hot water to rinse the kitchen dishes. Colored clothes do not have to be washed in warm or hot water. This wastes energy and causes the colors to fade. Clean the lint trap of the clothes dryer regularly to maximize the air flow within the machine. Keep indoor shading devices clean so they can work properly. Consider replacing the pilot lights of gas burning furnaces and water heaters with electronic ignition devices. Natural light can be reflected deep into a room by reflective sills, blinds and other architectural features to supplement artificial lights. Keep auto mufflers and exhaust systems in good repair to reduce emissions and to keep the miles per gallon high. Operate kitchen exhaust hoods only when the cooking surfaces are actually in use. Designate an energy monitor at the office. It is important to provide adequate ventilation when using kerosene space heaters or wood burning stoves. There must be sufficient oxygen available for complete combustion and the products of combustion must be vented from the occupied space. Use paints and toxic chemicals in a well ventilated space. Blue flames on a gas stove mean it is not adjusted right. The flames should be yellow. Ground source heat pumps are efficient and environmentally friendly. Electronic dimmers can cause harmonic distortion in a building's power distribution system. Avoid using them where equipment is sensitive to the quality of power. Calibrate thermostats so they maintain the right set point. Adjust the ceiling diffusers to spaces that are over or under heated. If the diffuser is not adjustable, replace it with one that is. Post signs near thermostats to remind people of the ideal setting. Consider automatic door closers on swinging exterior doors. Relocate thermostats if they are near outside walls, in seldom used areas, near heat sources or in a draft. The best position is near the return air grill on an inside wall. Thermally seal all unused windows. The solar heat gain substantially. Reflective materials on the window side of draperies reflect solar heat when the curtains are closed. If roof insulation cannot be added, then put it at the top floor ceiling. Painting ceiling and walls with a lighter and more reflective paint, ceiling tiles or floor coverings will increase the light level in a room. Wash windows frequently to take best advantage of daylighting. Replace light fixture lenses that have become yellow or hazy with age with a clear acrylic lens that will permit the most light to pass. Water indoor plants more often in the winter because central heating dries the air out. Purchase an energy efficient home or upgrade your older home with the latest energy conserving materials and equipment. Keep a kettle simmering on the oven to raise indoor humidity in the winter for increased comfort. You will also be able to turn the thermostat down a few degrees and still be comfortable. Move desks and work surfaces to take advantage of daylighting. Use room and area lighting only when it is needed. Increasing light levels in a cool room in cold weather may improve the occupant's perceived comfort. Arrange work surfaces so that sidewall daylighting crosses the task at a perpendicular angle to the line of vision.